Spring in Maggie Valley, North Carolina is a wonderful time to visit the town and the surrounding Blue Ridge and the Smoky Mountains. Visiting during the months April - June allows you to watch the dormant mountains come to life. Wildlife emerges and begins to forage for food - this includes Elk, Bear, Fox, Deer, and many other animals. If you want to see the mountains come alive in the Spring, Maggie Valley NC is the place for you! This 5-day "Spring Fun" Itinerary will help you get the most out of Spring while you're visiting us here in the wonderful and historic town of Maggie Valley. You'll see some amazing Spring Blooms and Wildflowers. You'll relax by crisp and cool waterfalls, enjoy amazing views, and eat some fantastic food! ​Country Vittles is a Maggie Valley staple and has been serving big old family style breakfasts for many years here in the Valley. Stop by in the morning, for a hearty breakfast, including all the essentials: eggs, sausage, bacon, biscuits, gravy, and more, all served family style, and all you can eat. ​Big Creek, in the Great Smoky Mountains National Park, is one of the most beautiful areas of the Park. Big Creek is full of waterfalls, history, scenic views, and hiking trails. Midnight Hole - A popular Swimming Hole, where kids can swim, and plung off rocks next to a small waterfall. Big Creek is very well known for it's abundance of Wildflowers, both alongside the trail, and alongside Big Creek itself. In particular, there are lots of Trillium, in various different colors. ​After an exciting day of hiking, return to Maggie and Frankie’s Italian Trattoria for dinner, located at 1037 Soco Rd, Maggie Valley, NC. Maggie Valley has the best Italian restaurant in Western North Carolina! Enjoy a drink and dinner at the bar, where many visitors and locals hang out or make reservations for a table in the wonderful dining area. Frankie’s has all the traditional Italian dishes, plus a number of unique menu items as well, including the best Pizza around. Be sure to try the Lasagna or the MVP (Maggie Valley) Pizza! ​For breakfast, head over to one of the oldest and most established restaurants in Maggie Valley, Carver’s Maggie Valley Restaurant, located at 2804 Soco Rd. You’ll find all of your country style breakfast favorites, cooked hot and fresh. Be sure to get some fried Mountain Trout, eggs and biscuits and gravy! Spring is an amazing and beautiful time to drive on the Blue Ridge Parkway for scenic views and of course wildflowers. Wildflowers grow all along the side of the road, and at many of the overlooks. MP 451.2 - Waterrock Knob - Amazing scenic views from the Parking Lot, and a short, steep and fun hike up to the top. MP 431.4 - Highest Point on the Parkway, Richland Balsam Overlook - A very popular photo spot, past the Waynesville Exit, The Highest Point on the Parkway at 6, 047 feet. MP 430 Cowee Mountains Overlook - Stunning Views, and if you catch it towards Sunset, the views and lighting can often be amazing. MP422.4 - Devil's Courthouse - Climb the steep but short paved walk up to the top for amazing views. MP 418.8 Graveyard Fields - Amazing spot for waterfalls, swimming, and enjoying the numerous wildflowers. MP 417 – Looking Glass Rock Overlook - Beautiful view of an iconic rock feature, and also the trailhead for Skinny Dip Falls, a beautiful waterfall and popular swimming hole. >> For more information on the Blue Ridge Parkway, visit out Blue Ridge Parkway Guide. ​Return back to Maggie, either via the Parkway, or through Waynesville NC and have dinner at J Arthur’s Restaurant. J Arthur's has been serving locals and visitors in Maggie Valley for years, and is one of the most popular restaurants in the Valley. Visiting Cataloochee Valley pretty much anytime of the year, is like taking a Time Machine back a few hundred years, to a time when things were peaceful and simple. You'll find historic homes, creeks to explore, hiking trails, and of course the famous Elk. ​Maggie Valley is fortunate to have a wonderful bakery, Moo Mountain Bakery. They serve a number of fresh and hot hand-baked items, including their incredible Cinnamon Buns. You will also find great coffee, and a number of different types of hot and fresh bagels as well. You can get your items to go, or sit down in their warm and comfortable sitting area. Moo Mountain Bakery is located at 2511 Soco Rd, Maggie Valley NC. Cataloochee Valley is about a 30-40 minute drive from Maggie Valley. Cove Creek Road, the main road in is an adventure itself, as it twists and winds itself along the mountainsides into the Great Smoky Mountains National Park, and Cataloochee Valley itself. While in Cataloochee, be sure to visit the historic homes and buildings, including Palmer House, Caldwell House and Barn, Palmer Chapel, and this historic schoolhouse. There are numerous areas to picnic, so pack a picnic lunch and eat lunch right there in Cataloochee Valley. Boogerman Trail - This strenuous 7 mile roundtrip hike, will take you through the historic property of "Boogerman", a well known Cataloochee Valley resident. You'll see his old homestead, and while there, see some of the largest old growth trees in the National Park. Rough Fork Trail - A very pretty and moderate trail, that takes you to the Woody House. Pretty Hollow Gap Trail - This creekside trail makes for a nice stroll, and being out and back, you can adjust the length. Chances are you'll see Elk, and maybe even a bear. Elk are very common in Cataloochee Valley. The best times to see them are early in the morning, and late in the afternoon. They come out when the sun isn't as hot. After a full-day in Cataloochee, return to Maggie Valley for dinner at Brickhouse Burgers & Pizza. The staff is friendly, and food reasonably priced, and delicious. They have a great selection of salads, burgers, chicken sandwiches, Pizza, and Calzones. You really can’t go wrong with any of these choices! You’ll find Brickhouse Burgers & Pizza at 3914 Soco Rd, Maggie Valley, NC – Park in the back, as the front parking is for takeout only. Spring at Biltmore Estate, in Asheville NC is magical. The Estate and Gardens come alive with flowers of all varities and colors. 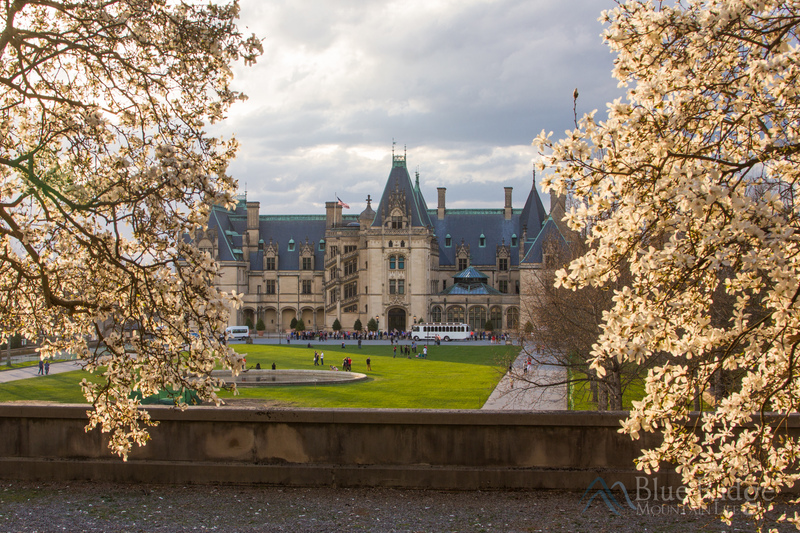 Biltmore celebrates this time of year with Biltmore Blooms. Springtime at Biltmore Estate is a treat you will not want to miss. Biltmore is located about 40 minutes from Maggie Valley, and is well worth the drive. Be sure to book your tickets online and in advance for discount. Arrive early, and reserve your house tour early in the morning. As the weather warms home, the crowds combined with warmer temperatures can make the house a bit hot and stuffy. Morning is the best time to do the indoor tour. After your tour, grab lunch in the Carriage House, then head down to the gardens. If you're visiting during Biltmore Blooms, the thousands of tulips in the walled garden will be the highlight of your visit. >> For more infomation on Biltmore Estate, and things to see and do while you're there, you'll want to check out our 2018 Biltmore Estate Guide. If you would like to eat at Biltmore, both Cedric's Tavern and the The Bistro are both excellent, and located in Antler Hill Village. You can also explore downtown Asheville, which has many different and wonderful restaurants, from a Brazilian Steakhouse, to Breweries, to Indian and French Food. Flat Creek Trail is a simply gorgeous trail during the spring and is located just a short drive from Maggie Valley. This trail is full of wildflowers and creeks, April - May, and also has blooming Mountain Laurel and Rhododendrun in late May and June. Organic Beans and Coffee is our goto coffe shop in Maggie Valley. Not only will you be served fresh and hot coffee, they also have a number of pastries and breakfast items, including fresh baked scones. The trailhead for Flat Creek Trail is located at the end of Balsam Mountain/Heintooga Rd, off the Parkway. The trail is out and back, but if you would like a shorter hike, you can park one car at the end of the trail, and drive on up to the trailhead. Then you can just drive back up t the trailhead when you're done hiking. Flat Creek trail from the trailhead is mostly downhill, and while hiking you'll cross over a number of small creeks surrounded by Rhododendrun, and numerous wildflowers all along the trail. The trail provides a very peaceful, scenic and colorful hike. It's one of our favorites, and great for families with children. We recommend hiking in the morning, when the temps are cooler. that will allow you to get back to Maggie, and spend the afternoon exploring the town and do a little shopping. On the way out, stop off at the Masonic Marker, and watch for Elk. They are often grazing along Balsam Mountain Rd. When you get to the Maggie Valley exit from the Parkway, take as short excursion down HIghway 19 to Soco Falls. Located in the Maggie Valley Inn, and serve up a variety of items from steaks to Pizza. They also have a buffet on certain days and a full-service lounge. The food is good and reasonably priced. They’ll have something every member of the family will enjoy! Try the chicken fingers, best in the Valley! Rendevous (or the Vous as locals call it) is located at 70 Soco Rd, Maggie Valley, NC. While we’ve made particular recommendations for restaurants, shops, and attractions in our suggested itineraries, there are numerous other shops, restaurants, and attractions you can visit. Maggie Valley is full of things to do, and surrounded by waterfalls, and hiking trails. Need a place to stay? Be sure to check out our full list of places to stay when visiting!